For my fortieth birthday I got myself statues from Sideshow (what else would a forty year old want?). Being an adult is awesome. It’s true that you can’t really play with statues. But you can’t play with toys you leave in the box either. At least I get to take these out of the boxes and display them! All of these are limited edition productions and are available from Sideshow.com at the time of this posting. I have no illusions that anyone will click through this link and buy this guy, but nothing ventured, nothing gained. It’s seriously a great figure. Sideshow: Millennium Falcon, Liberty and Justice for All. It’s been awhile since I’ve gotten any pop art (like… weeks). For some reason Sideshow Collectibles has appeared on my radar quite a few times in the last couple of months and I admit to spending a fair amount of time browsing their product offerings. In December two things really hooked me and I placed preorders for both. The first was “Liberty & Justice: Trinity,” a limited edition print by Alex Ross. I am a super hero sucker and Alex easily makes my top five favorite artist list. The second item was a diecast Millennium Falcon by EFX. I had been mulling over the idea of buying a vintage Kenner toy but the 19″ Falcon from EFX filled the position nicely. My first two ordering experiences with Sideshow went fairly well. They take a down payment (non-refunable) and they are good about letting you know when the balance will be changed and when the pre-order is expected to ship. They also offer a reward program for customers which gives you about 5% back (although it take a month for the rewards to become available… c’mon, I got stuff to buy!). I imagine I’ll be a regular customer as they have quite a few items I’ve got my eye on (I’m looking at you, Optimus). I missed out on the NES Classic but I wasn’t about to make the same mistake with the SNES classic. My friend, Jesse, did some expert-level reconnaissance and we selected the Ceder Hill Walmart as our aquisition target. We set up shop around 6 pm, knowing that the units wouldn’t be released until 12:01am. It was a wait we were willing to endure. And it wasn’t bad at all. For starters, they let us “camp” in the back of the store by the electronics section (so much better than waiting outside). Also, have you been to the Ceder Hills Walmart? Wow. Game changing. It’s like someone cared. Also, friends! Hanging out with friends (even in a line) is just fine with me. This story has a happy ending. 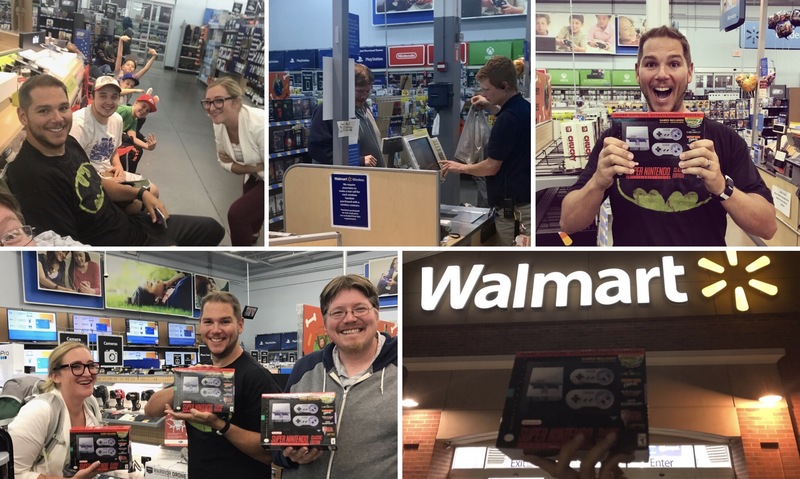 We all got our SNES Classic systems. Afterward, I even drove by Best Buy where I found people camped out for these little beauties. Poor saps. The SNES Classic includes exactly what you’d expect: A tiny replica of the original SNES unit, two controllers, a power and HDMI cable. The menu options are well configured and the games played exactly like I remember. I hate to be the bearer of bad (good?) news but the games also look exactly like I remember (minus the scan lines- an option you can add in setup if you’d like). The controllers seemed a little stiff (possibly edging into unresponsive territory) so hopefully they will break in a bit. I don’t think I’ll spend a ton of time playing on the SNES Classic but it’s definitely a cool little toy. This is normally more than I’d spend on a model, but I have a certain affinity for white Turbo S cars. The detail level and over all quality on this car is outstanding. I wish the doors opened, but, as in real life, I guess I’ll just have to be satisfied with peeking through the windows (the interior is also well executed). Production on this piece is limited to 1,911.